Oil does not dissolve in water. It lasts a long time and sticks to everything from beach sand to bird feathers. Oil and other petroleum products are toxic to people, wildlife and plants. One pint of oil can make a slick larger than a football field. Oil that leaks from our cars onto roads and driveways is washed into storm drains, and then usually flows directly to a lake or stream without being treated first. 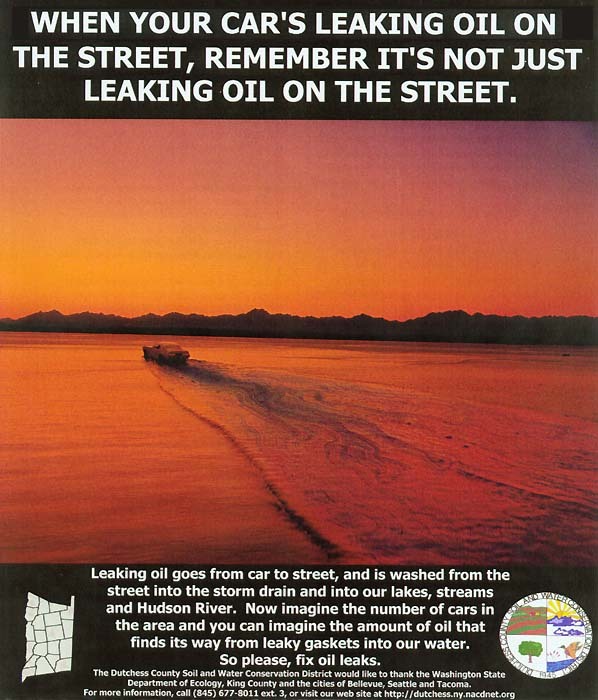 Used motor oil is the largest single source of oil pollution in our lakes, streams and rivers. Americans spill 180 million gallons of used oil each year into our waters. This is 16 times the amount spilled by the Exxon Valdez in Alaska. How can you use and change your motor oil and help keep our waters clean? • Stop drips. Check for oil leaks regularly and fix them promptly. Keep your vehicle tuned to reduce oil use. • Use ground cloths or drip pans beneath your vehicle if you have leaks or are doing engine work. Clean up spills immediately and properly dispose of cleanup materials. • Do not mix oil with gasoline, solvents or other engine fluids. This contaminates oil which could otherwise be recycled, increases the volume of waste and may form a more hazardous material. • Never dispose of oil or other engine fluids down the storm drain, on the ground or into a ditch. • Recycle used motor oil. Many auto supply stores and gas stations will accept used oil. Recycling just one gallon of used oil can generate enough electricity to run the average household for almost 24 hours. • Buy recycled (re-refined) motor oil to use in your car. Special thanks to the Dutchess County Water Quality Strategy Committee and the Hudson Valley Regional Council. This information is brought to you by the Dutchess County Soil and Water Conservation District. Established in 1945, the Dutchess County Soil and Water Conservation District has been working with individuals for over 50 years to coordinate state and federal conservation programs at a local level. The District provides technical assistance and education on soil, water, and related natural resources. Municipalities, farmers, and landowners use this information in making proper land use decisions.